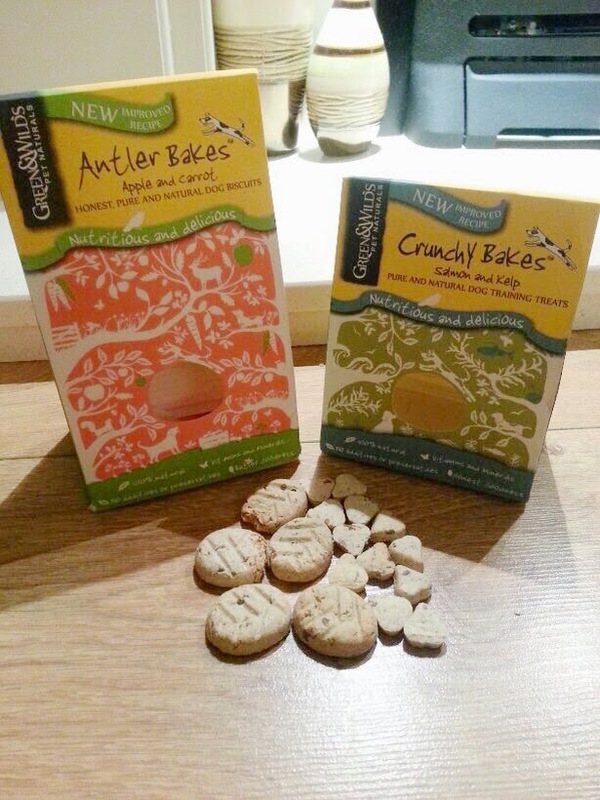 Yummy Treats and Chews | Green and Wilds Product Review. Food, I just can't get enough of the stuff what doggy doesn't love something yummy! Therefore I was really exicted to receive some new yummy treats and chews for me to review from the newly named Green and Wilds. What dog doesn't love receiving present. Who are Green and Wilds? You may have noticed their new name popping up on their online shop and labels? 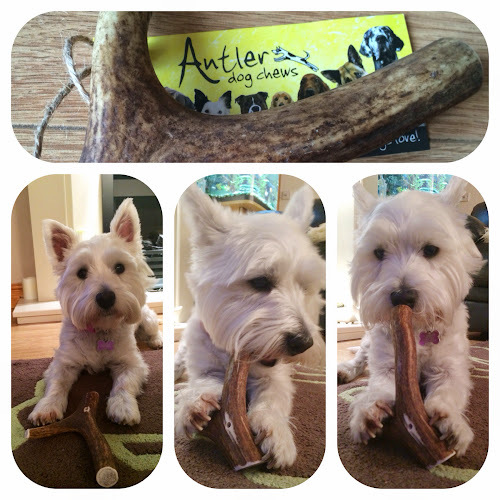 With lots of great new natural products coming along, they wanted a name to embrace this, the old "Antler Dog Chews" name just didn’t cut the mustard! So they changed it. We say what a great idea and much prefer their new name, it definitely makes the products sound more natural. Green and Wilds is an independent business that supplies healthy, natural, unprocessed, completely sustainable dog chews, hand baked luxury dog biscuits and natural eco toys. The company is based on solid ideological beliefs, run on ethical principles by ethical and caring people. They are committed to looking after our planet and living in a world where we treat others as we would like to be treated. They produce chews from whole antlers, naturally shed from healthy, free ranging deer and hold large stocks so no animal are ever harmed for the chews. All their chews are free from chemicals, preservatives, colouring and additives, just pure and natural as nature intended. We really are not keen on rawhide in this house so are always looking a tasty alternative. Hence we have brought many antler chews before. We haven't however tried there brand new range of baked treats. Training is such a big part of mine and Lottie life we are always on the look on for some new training treat, luckily for us they sent us a box of their brand new Salmon and Kelp Training Treats as well as some Carrot and Apple bakes, a medium original antler and a fallow strip. I was one very lucky dog! Firstly the baked treats, they are all wheat, preservative and artificial flavour free, and have no added salt and sugar. Only natural ingredients are used. They come in two varieties which are both avabibale in two sizes small as training treats and a larger size as a dog biscuit. They both come in two flavours, Apple and Carrot and Salomn and Kepl. 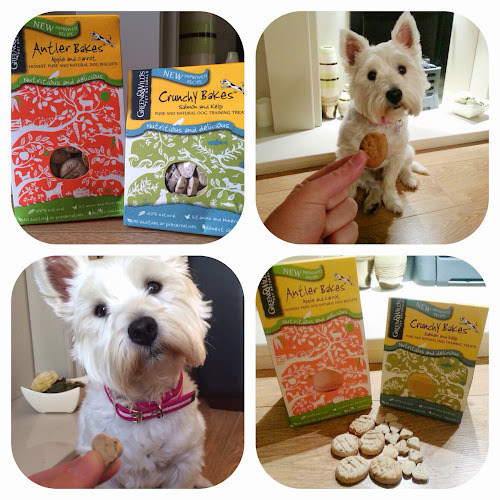 Antler Bakes Dog Biscuit , Apple and Carrot (£3.29) - these wholesome biscuit are baked in the UK with love and are free from all the nasties, NO shameful flavourings, flavour sprays or preservatives, no artificial colourings, sugar or salt added just wholesome ingredients that dogs love. So not only do they taste great they are also great for your dogs health. They contain the famous Green and Wilds ground antler powder as well as a great mix of other naturals ingredients including carrots, apple, parsley, rosemary, garlic these have a range of health benefits including improving your dogs circulation and metabolism as well as reducing cholesterol. They are also high in minerals and nutrients which can help strengthen bone structure, muscles and joints, maintain healthy cells aiding the immune system as well as helping to prevent inflammation from arthritic conditions. After a ruff day give your friend a treat, you know they're woof it! Dog Bicuits on the left, Training Treats on the right. Dog biscuits on the left, training treats on the right. Crunchy Baked Training Treats, Salomn and Kelp (£2.79) - it's not just the dog biscuits that have all those added health benefits these great sized training treats do too. Containing carrots which is a great source of vitamins A and E which are great for healthy skin they are sure to keep your dogs coat looking great. They also contain salmon, kelp, flax seed and rosemary. As a result these training treats can help bad breath, are high in fibre and are a excellent source of Omega 3 and 6 fish oils. If your going to use clicker training to train your dog why not treat them with the healthiest training treats around. Essentials Antler Dog Chew, small (£6.59) - These chews are 100% natural, long lasting, are fantastic for teeth and full of great minerals for good health. 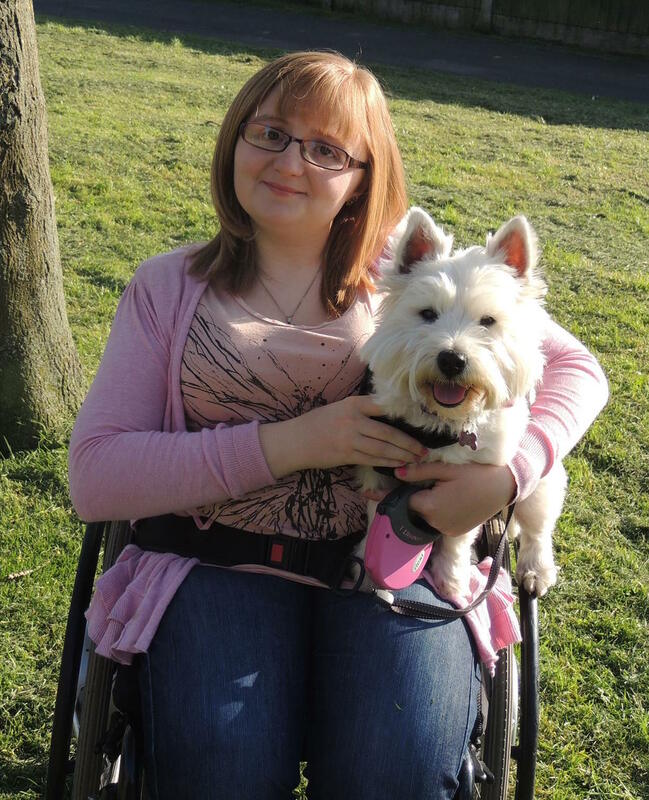 Vets recommend them and dogs just love them, finding them exciting and irresistible. Being a totally natural product, it's free from additives, colours and preservatives, it's hypoallergenic, low odour and non-sticky too! All chews are hand washed and cut and then sand finished on all edges. Size - medium is suitable for medium sized breeds from Cocker Spaniels to Border Terriers. It will be around 11cm long, depending on circumference and density of the antler. Other sizes available include medium, large and x large. 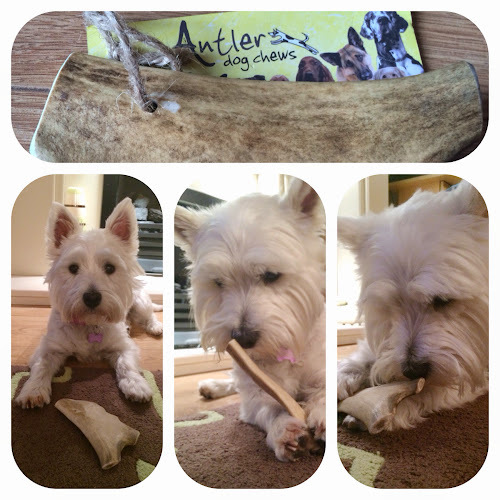 Fallow Antler Dog Chew (£5.08) - These softer superior antler chews are great for older puppies and softer chewers (Particulary breeds such as Westie's who tend to be soft chewers). These chews have the same added benefits as the original antler chew as they contain a number of good minerals and are long lasting. All their Antler chews are from naturally shed/dropped, sustainable, free ranging, deer antler, 100% guaranteed. Verdict and Where to Buy. Two main focuses in our household are training and weight, both of which are not a problem with these great products. They are high value so Lottie will work extra hard in training as well as been low in fat. We also says a BIG no no to rawhide so are always on the look out for a tasty alternative that aren't high in fat, both chews are an ideal alternative to the dreaded sloppy rawhide. The training treats and biscuits Lottie's loves. The apple and carrot dog biscuits smell extra yummy and are almost good enough for me to eat (although I did resist, I don't think Lottie would of been to impressed). We find a lot of high value treats often leave a lot to be desired in there ingredients but as these are all 100% natural we love them! Lottie gives all the goodies that were provided a big 5 out of 5 woofs, they are also at a great low price and for the biscuit and training treats offer a variety of four boxes for the great price of £11.99 what more could you possible ask for! All of the great goodies are available on Green and Wilds website and they offer free delivery for orders over £39. They also sell to trade so you may find them in your local pet store, vets and farmers market and all manners of traders. To browse there great range of products click here. We received a box of goodies from Green and Wilds at no charge in exchange for our honest and fair review of the product. All opinions expressed here are our own and truthful! 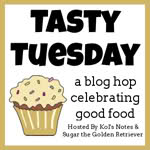 Wordless Wednesday - almost | Doggy play date.